Oh, the ubiquitous red barn — we all know and love it, and have come to expect their presence in much the same way we might expect to see pigeons in the city or ducks at the lake. Calaveras County is rich with them, and you’ll see many en route to Murphys, Red Apple Ranch and the many attractions the area provides. One, in particular, is home to the Calavares County Historical Society’s museum. The Red Barn Museum — formerly the old County Hospital dairy barn — stands proudly as a dominant landmark along Mountain Ranch Road. 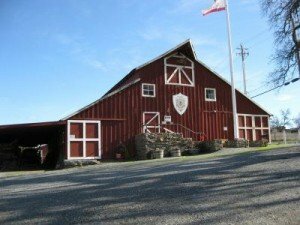 The Red Barn Museum showcases Calaveras County’s rich history in agriculture, mining, logging, and ranching. Actual mining carts, farm wagons, and other objects make up the elaborate displays, many of which were made possible through the help and donations of community members and local businesses. It’s fun, interesting and educational, and it’s just 19 miles northwest of Murphys. TRIVIA: What’s with those red barns, though? The tradition started with European farmers centuries ago. While no one knows absolutely how this tradition began, there are two more predominant theories. Farmers used to seal their barns with linseed oil combined with lime (and sometimes milk). While some believe that wealthier farmers would add the blood from their most recent slaughters to add color and prestige, others believe that farmers would add ferrous oxide (otherwise known as rust) to the mixture as it served as a deterrent for molds, mosses and other fungi. Over the centuries, what was once practical became fashionable. As the Europeans began settling in the United States, they brought the tradition of the red barn with them. Even more conveniently, the pigments used to make red paint in the 1800s were inexpensive, making red paint one of the most affordable colors of the time.